Daryn Eller is a Venice, Calif.-based writer whose work has appeared in "Prevention," "Parents," "Ladies Home Journal," "Self," "Health," "Natural Health," "More" and many other national magazines. She has written and ghost written many lifestyle and health-related books. Make collards, mustard and/or turnip greens a staple on your shopping list. 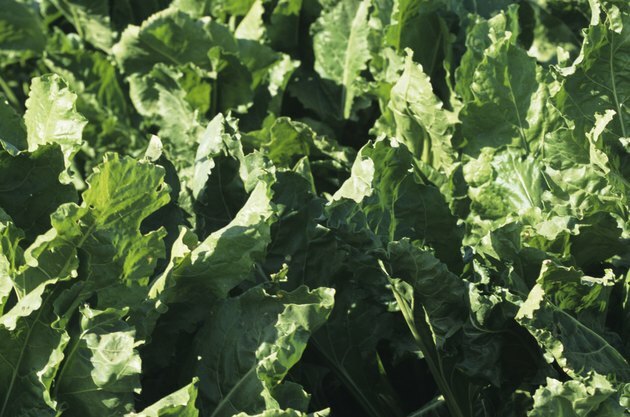 For optimal health, the U.S. Department of Agriculture recommends eating 2 to 3 cups of cooked greens each week, so buy enough for several servings. Look for greens with crisp leaves that have no yellow or brown edges. Smaller leaves tend to have a milder flavor. To store the greens, wrap them in damp paper towels and slip them into a plastic bag. Place it in the crisper for up to five days. Wash the greens right before you are ready to cook them. Fill a basin with temperate water and add the leaves. Gently swish the leaves around in the water to dislodge any dirt. Repeat if necessary. Drain the leaves and shake off excess moisture. If the stems are large, fold the leaves in half and use a sharp knife to slice off the stem. Next, coarsely chop the leaves. Choose a healthy cooking technique. Unfortunately, the traditional Southern way of preparing greens—simmered with fatty ham hocks or bacon—can cancel out the vegetables' healthier qualities. Greens retain more nutrients when they are steamed or sauteed rather than simmered or blanched, and neither technique requires excessive amounts of unhealthy fats. Steam collards, mustard and/or turnip greens in a steamer that is inserted into a large pot. Fill the pot with water so that it reaches just below the bottom of the steamer. Bring the water to a boil, then add the greens to the pot. Cook for 5 to 7 minutes, or until the greens are wilted but still vibrant. Another option is to sauté your greens. Heat 1 tbsp. of canola or olive oil in a large pot or skillet over medium-high heat. Add the greens, working in batches if they won't all fit in the pan, and toss with a wooden spoon until they wilt. This will take about 5 minutes. If the pan gets too dry and the greens begin to stick, add a few tablespoons of water. Season your cooked greens with salt and pepper, to taste. If desired, add a drizzle of olive oil and a squeeze of lemon to add flavor. The vitamin C in the lemon will also help your body absorb the iron in the greens. Farmers markets often offer freshly picked greens. If convenience is a priority, you can find bags of prewashed and chopped mixes of Southern greens in some grocery stores. Collards, mustard and turnip greens are also available frozen.